NGOs use events and forums to create platforms for their messages. Liveblogs broadcast your events online and are used for your marketing goals. Thus, you can reach even more people with your event. Besides covering your event live, it also results in a great multimedia documentation which is perfect for retrospection. Thus, a multimedia documentary of your event is created, and your members/followers can keep track of it at home or while working, similar to a sports liveticker - just much better. 2. 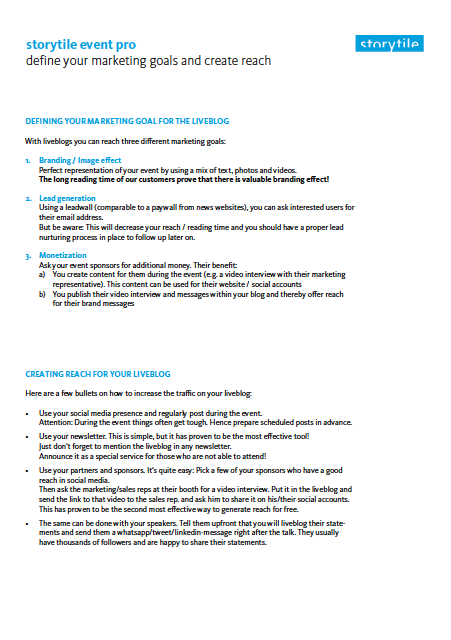 How can I reach my marketing goals? Most important for our customers is to choose the right marketing goal for their liveblog: Do they want to achieve a general effect for their image oder do they want to generate leads? Conferences organized by foundations generally focus on the message and its effect. The foundation aims to gain attention for a specific topic with their conference. A liveblog can transfer these messages to people who are unable to attend. Some activities of NGOs focus more on the generation of leads. Here our lead generation tool helps you to get to know them.